<- Read the previous post: Kootenay Bound! Today started see-your-breath cool in Castlegar RV Park. We had already decided that we had had our fill of major climbs (5hrs straight from Hope; 3hrs from Osoyoos; 4.5hrs from Midway) so avoided Selmo-Creston and cycled via Nelson. This route is longer (169k vs. 125k) with rolling hills along beautiful Kootenay Lake, but NO mountains to climb. The breeze off the lake was fresh and cool so leggings were in order. Several highlights include passing through beautiful Nelson (must come back) and a number of incredible waterfalls on the Kootenay River. We were blessed to be greeted at Nelson by Craig Korth (banjo player extraordinaire some will remember from Jerusalem Ridge and CKUA). He and his family now live in Nelson. Anyhow, Craig guided us through Nelson using a shortcut because we really wanted to make the 1:10 ferry. We did so but only by assuming team racing pace for at least 7k. During the 35-min ferry, we scarfed some food and plugged away to complete 140kms over 9.5hrs. BTW, in the campgroud, we met folks whose tow vehicle broke down on Selmo-Creston (glad we went around!). 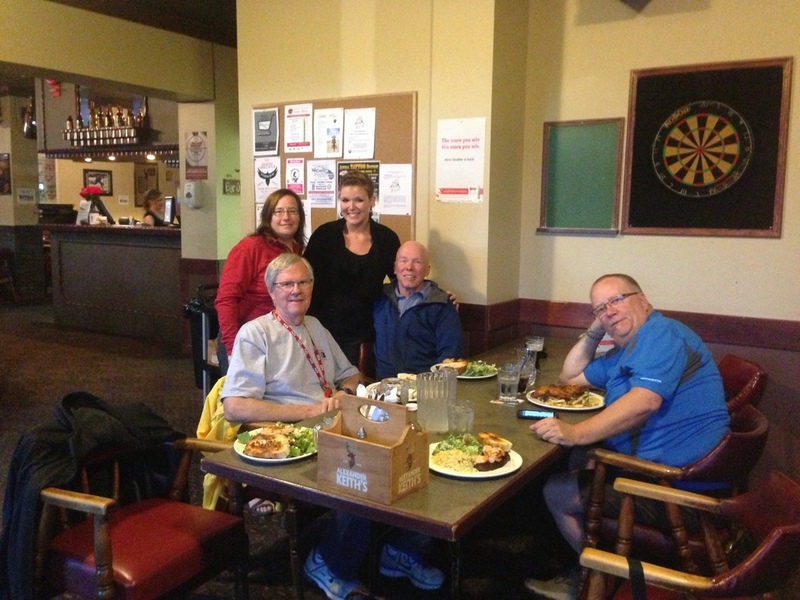 We were all bagged so went out to eat at Jimmy’s Pub & Grill (yes we like pub grub). Tragically we heard more stories of people suffering from depression. We are thinking of you. If you read this, please don’t be ashamed to seek help. Know that there are people who care, and can help you create a better life for yourself. Another long day (9-6) starting where we left off yesterday, 22km short of Creston. More rolling hills along Kootenay Lake (really nice road with little traffic. As we moved away from the lake we paralleled a gorgeous valley with grain crops and a tree nursery backed by stunning green mountains! Turning inland after Creston we experienced more gentle but longer ups under blazing sun. Afternoon brought fewer ups but a long run to Cranbrook and the great hospitality of Mount Baker RV Park. Tomorrow, Day 9, is our first “rest day” so we will be busy doing laundry, checking bikes and getting massages for weary muscles. 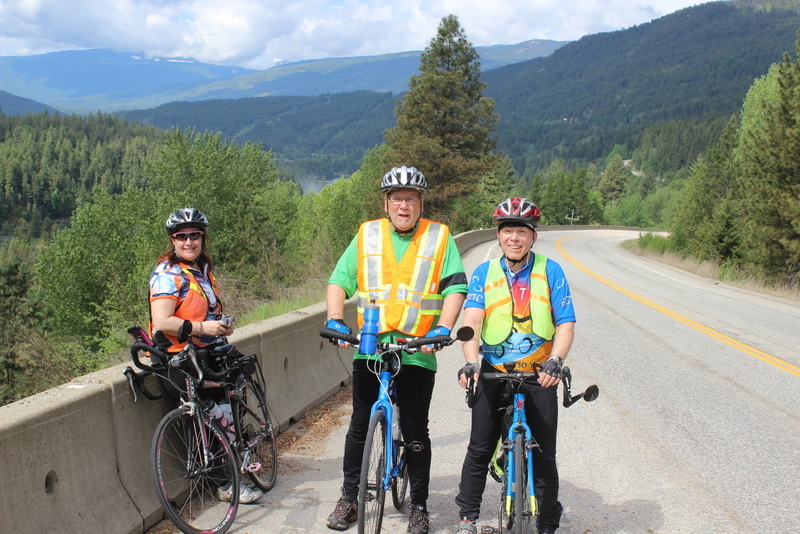 This entry was posted in Riders' Ramblings, Terry Fannon and tagged Craig Korth, Cranbrook, Creston, ferry, Melissa by Terry Fannon. Bookmark the permalink. You guys are amazing. I have driven those roads in a vehicle and can’t imagine riding a bike up those mountain climbs. Keep up the great job. such a spectacular drive through kootenay region. Fantastic!!!!!!! Enjoy yr rest day. Stay safe. Hi Terry, Sue and Bill. We love reading your posts. I close my eyes and can only imagine the beautiful scenery, pedalling up those steep climbs, all the while staying strong. We watch you every day on the Spot Tracker and wonder what each new day will bring. It’s quite humbling . . . the kindness of people and their generosity. And it’s quite humbling . . . to know our three friends are riding for something so meaningful. Enjoy the time with your family and friends who made it down south to see you this weekend. Sending much love your way . .